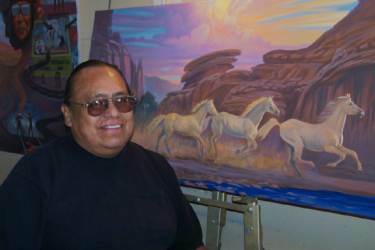 Native American Artist, Teddy Draper, Jr., is the son of a WWII Navajo "Code Talker" Ted Draper, Sr. and has been the recipient of many prestigious awards for his art. 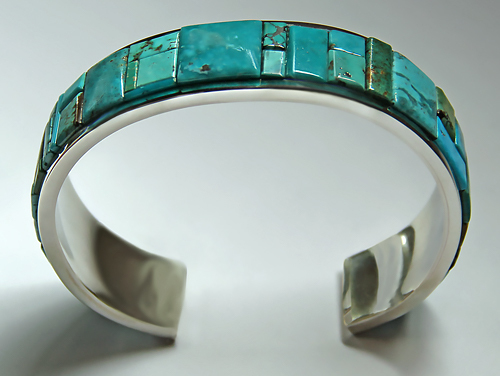 He is a master of pastels and excels in oils, watercolor, traditional and contemporary design Navajo jewelry. The unique Draper pastel technique, constantly refined over thirty years, is his own personal style and his interpretation and artistic vision of what he calls "them unseen colors". Ted resides on the rim of the Canyon de Chelly near his studio and gallery with his wife, noted jeweler Ophelia Garcia. August 19-20, 2017: Teddy Draper, Jr. will be exhibiting his work at the Santa Fe Indian Market. Giclee on paper, 15" x 30", edition of 30, $1,200 - only 3 left. Permssion required for duplication of any kind.